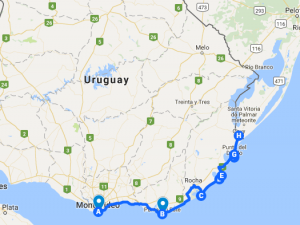 Uruguay was not in our initial route but we are lucky that we change it because we liked a lot the coast of that country. Our first stop was Punta del Este, we already knew that it is a really touristic city with a lot of skyscraper, so we though we would not like it, but the beaches are really beautiful and we could find a nice place to sleep close to the see, hearing the sound of the waves… In the morning went we woke up, we run through the beach and when we came back we found a notification saying that we were not allowed to sleep there. Luckily it was only a notification and not a fine! We take a bath in the see, a short shower in the showers of the beach and we run out of there! Finally we arrived and we camped in a police camping! This was much more cheaper than the other ones. There we spent two nights organizing the things inside the van and Jose fixed also the water tank that was not working properly. Once we went to the beach to see the sunset. It was a bit cloudy but it was beautiful! And there we meet Tina and Joffrey, they were really nice and our time ended very late at the beach drinking fernet-coke, listening Joffrey playing guitar and watching the stars… We also discover what a murga is, it is like the chirigotas in Cádiz. They are form by 17 people who play and sing songs very funny with a lot of satiric component and social critic. We were having fun but it was time to continue, we just empty our tanks, fill the water and we were ready to go. While driving out of the camping cactus got stock with an electricity cable! With so bad luck that it broke one of the boxes we have in the roof and bend our roof rack. Someone to came to the camping while we were there use this cable to fix his tent, setting lower the cable than when we enter and that’s why we got stock… Now we are really concern about that and all the time checking if we fit or not. To sleep we went to Valizas, very close from Cabo Polonio and also impressive. There are huge dunes at the beach in front of the Atlantic Ocean. We walk around them and we saw the sunset from the top, in one side the see and in the other a view like a savanna or how I imagine Africa. Lovely!! The last stop very close to the border with Brazil was Punta del Diablo, another natural town, without paviment, with incredible virgin beaches, so unspoiled that we saw a lot of shells, mollusk, fish eskeleton and also a marine turtle putrefying L We meet there Beatriz and Antonio, they were our neighbors at the beach. They are a really nice Brazilian couple who gives us maps, information and tips about Brazil.